So this week we received the (not entirely unexpected) news of the government’s plan for a referendum on the UK’s membership of the European Union. Comparing the pros and cons of EU membership is extremely complicated and I’m not going to attempt that today. Before we even start thinking about that stuff it’s worth considering whether this issue is actually best decided by a referendum in the first place. Referenda (pats self on back for pedantic pluralisation) are, on the face of it, a fantastic testimony to the democratic values we hold true – a single important issue and everyone of voting age gets their say. Should the UK cut income tax for rich people from 50% to 45%? Should the UK implement real-term cuts in benefits for poor people? Given that the Austerity Fairy hasn’t shown up to magic away the depression, should the UK pursue economics instead? On these important points, the government has felt ok to decide for us, so what is special about EU membership? We obviously can’t have a referendum about everything but this process is at best unclear. I suspect the reason for this is that David has found himself in a difficult position and were he to decide this himself he would lose either way. If he said that we would leave the EU he’d lose the support of the Lib Dems (even they must have limits as to what they can forget they stand for). If he said we were definitely staying in he’d face a backlash from his own party followed by the familiar sight of the Conservative party self-destructing when Europe is mentioned. For a man who markets himself as taking the “tough choices” this appears to be little more than an attempt to dodge the issue. Politicians from all sides will make every effort to fairly and factually represent the pros and cons of EU membership. When doing this will clearly show the reasoning behind these opinions and base this reasoning on the facts that we now know. Ok. So now re-read those bullet-points and when doing so, please bear in mind how plausible that sequence of events is. They will then give their opinions, to a now confused and misled public, as to what their preference is. Let’s not stop at politicians – how are the media going to behave in the run-up to such a referendum? Will The Daily Mail journalists all be writing responsible pieces to give the public as much information as possible so they can make their decision an informed one? Will The Sun, (previously of the headline, “Up Yours, Delors!”) be taking a responsible position to make sure their readers are all well-informed? Imagine that farce multiplied by ten. If we put this issue to a referendum then all we have to look forward to is the full force of politicians and newspapers from all sides pushing their own agendas, each one of them misrepresenting the real costs and benefits in order to intentionally mislead the people who will vote. Don’t misunderstand me – I like the idea of democracy but this just isn’t what I had in mind. The government says we can choose fairly but let’s be clear on what we’re going to get here – a tsunami of propaganda that will make any sensible consideration of the options utterly impossible. And you know what else? All those campaigns are going to cost a fortune. Where’s austerity when you need it? Looking back on 2012, I think it would be fair to say it was a fairly difficult year for the government’s economic credibility. No economic growth, no deficit reduction, a double-dip recession etc. There is one economic government policy however, that stands out from all of the rest and this is a blogpost about that one. Let’s begin. At the start of 2012, the Conservatives and the Labour party were polling fairly closely but following the announcement of the government’s “Pasty Tax”, Labour shot into a massive lead, which they have held pretty consistently ever since. If you are a regular reader of this blog, you might guess what my thoughts are on the “Pasty Tax” – yes, that’s right. In a year that the government spent creating and then stepping in huge economic cow pats, this one stood out for being… a good idea. To see why I think it was a good idea and why it was ultimately scrapped we need to look at both the economics and the politics. In the United Kingdom, value added tax is payable on chocolate-covered biscuits, but not on chocolate-covered cakes. McVities defended its classification of Jaffa Cakes as cakes at a VAT tribunal in 1991, against the ruling that Jaffa Cakes were biscuits due to their size and shape, and the fact that they were often eaten in place of biscuits.McVities insisted that the product was a cake, and according to rumour produced a giant Jaffa Cake in court to illustrate its point. After assessing the product on eleven criteria, including “texture”, “attractiveness to children” and “consistency when stale”, the court found in McVities’ favour, meaning that VAT is not paid on Jaffa Cakes in the United Kingdom. Now I can understand that there are often reasons for charging more or less tax on certain products. My job means I often have to fly somewhere in an aeroplane. Aeroplane travel is damaging to the environment though so I can understand the reasons that my flights incur a high tax. When the government taxes something then people will use it less, so the higher the tax is the less inclined my company will be to send me somewhere. They might decide that, given the costs involved, we should do a video conference instead. The examples discussed above are in no way related to giving people sensible incentives though. Although it is cheaper for me to order my sausage roll and wait for it to go cold before paying for it, exactly what incentive is this policy trying to create? 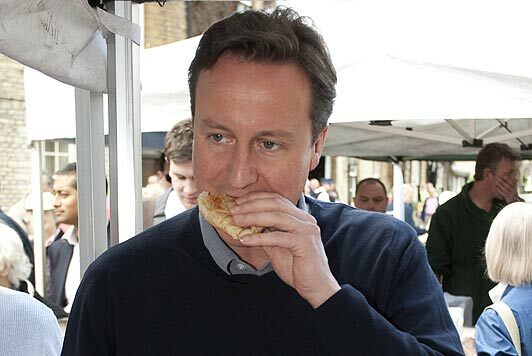 I have a cold sausage roll and the government has no tax revenue. Is that the outcome that the government is trying to engineer? No, of course not. Therefore closing this loop-hole was a good economic policy. Let’s have a quick glance at VAT on heating your house. VAT on gas and electricity is 5% rather than the standard 20% applied to most other purchases. This makes heating my house much cheaper than it would be if gas and electricity were taxed at the standard rate. Using gas and electricity though is not something that we want to encourage so why in the world would we want to give it a tax break? Let’s move on to the next subject. It turned out that the government’s one good economic policy of 2012 was so unpopular that they quickly reverted to economic incompetence and abolished it. 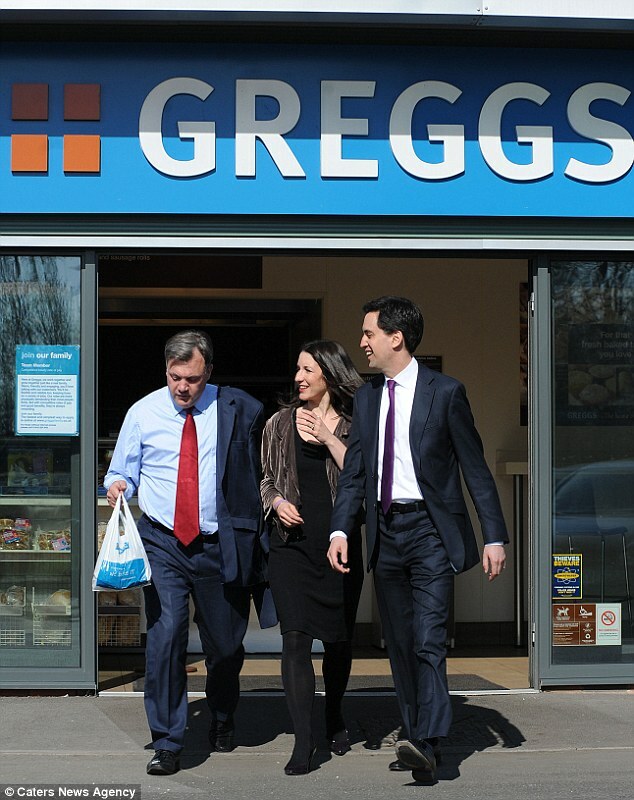 The Pasty Tax was scrapped and we retained the existing bizarre set of rules and incentives. But why was this? The answer is that, although it was economically good, it was politically bad. The media got hold of the policy and reframed it as a tax by the nasty party on pasties, which were, as we learned, the quintessential sustenance of the working classes. I like this photo. Ed Balls has even taken off half of his jacket in order to look more working class. With no clear winner, the cabinet then challenged the shadow cabinet to a pasty eating competition to decide who liked pasties the best. Labour was initially bullish but their advisors then realised that they’d be taking on Eric Pickles and it would be akin to playing the cabinet at football with Lionel Messi as Foreign Secretary. 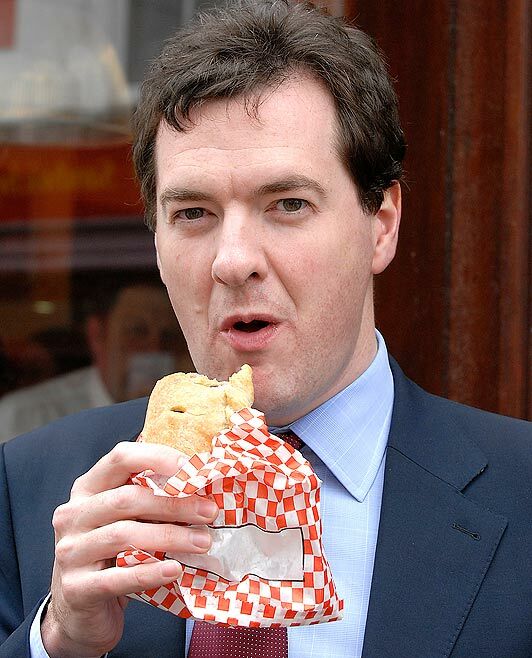 As it was then, we never found out which party liked pasties the best and shortly afterwards the government made a U-turn on their only sensible economic policy of 2012 and renounced the Pasty Tax. What is actually going on here is a clash between politics and economics. The two often don’t agree and when they don’t the government always favours the former over the latter. Although economically it is far better to have a sensible VAT system without odd, unexplainable loop-holes; politically it is harder to explain. Predictably the policy was dropped. And I am sure that some of you reading this will be saying that this is all well and good but if we put VAT up on heating our homes we will kill all our pensioners. Well, this is where we can use economics to trump politics. If I get more tax revenue from everyone then I can use some of it to pay more in benefits to the poor and old. I can make it so that a pensioner’s increase in income is equal to what they lose on heating their home. By doing that the pensioner doesn’t lose anything and the government still gains overall. I am in full-time employment but at the moment I pay 5% VAT if I switch the heating on and I pay 20% VAT if buy a jumper. This is not a tax policy that encourages sensible behaviour. Sadly we live in a society where politically good things always better economically good things. It’s not just economics though, health, eduction, the environment and everything else is subject to politics over sensible policies. So what should we do? I would like to live in a society where the government chooses to implement sensible policies and makes a big effort to explain why they were sensible so that we have a foil to the propaganda of The Sun and The Daily Mail and politics and sensible policies became aligned to the same things. Sadly I see little prospect of that though, so while we wait we may as well munch on a couple of Jaffa Cakes. They’re tax free after all. Tomorrow MPs will debate the real-terms benefits cuts proposed by George Osborne in his Autumn statement last month. (Was it Autumn last month?) Anyway, I’ve been wondering what all of this is about and have found some quotes from the government to shed some light on things. Oh, that’s a relief – I thought they were going to do something nasty to poor people for a moment. Oh, hold on – here are some more quotes from the government about what it’s like to live on benefits. …over the last five years those on out of work benefits have seen their incomes rise twice as fast as those in work. With pay restraint in businesses and government, average earnings have risen by around 10% since 2007. Out of work benefits have gone up by around 20%. Well, no wonder people’s incentives are moving from wanting to work to wanting to live off benefits – the benefits are going up twice as quickly right? Hmmm. So indexing benefits to prices has been far from unsustainable, or “unfair” to working people, over the last 30 years. Indeed it has resulted in a substantial reduction in spending on out of work benefits as a proportion of GDP, compared to the alternative of indexing benefits to earnings. So take a good look at that green line compared with the red line in Portes’s second graph. Average weekly earnings have far outstripped job seeker’s allowance for the past thirty years. If we accepted the idea that people are now choosing not to work because the benefits system makes job seeker’s allowance so attractive, then how would we explain that graph? It should have been much more attractive in the past than it is today. Now when it comes to many of the things that have gone wrong in the economy, people argue that George Osborne has been dealt a difficult hand, or that he is well-meaning but numerically incompetent. On this occasion though we can see exactly what has happened and it is just pure deception. There is absolutely no way that George wasn’t able to access to stats before 2007 – he simply ignored all of the data that didn’t back up what he wanted to do. When we look at the true picture we see that the income of those on job seeker’s allowance has fallen further and further behind the income of those in work. I don’t doubt that there are a small number of people who exist who can’t be arsed to get a job but these are a tiny minority and to label everyone out of work in this way, especially during a depression, is really unbelievable. Then at least we would be going into a debate on an honest premise. If we go into a debate based on a single statistic that was cherry-picked for the express purpose of distorting the debate and couple it with the propaganda in the quotes above, how can we really expect to get any kind of sensible outcome? And to the politicians it might just be a debate but let’s remember what we’re actually talking about here. Banks around the world caused a financial crisis on a truly huge scale. In the UK a million working people lost their jobs. They didn’t overnight choose not to work because they were “scroungers” or because they wanted to spend their days “playing computer games”. We are talking about cutting the benefits for people who, through no fault of their own, lost their jobs and are now in dire trouble with no imminent prospects to return to the work they had. Sometimes when I write these posts I’m despairing of the government. On other occasions I am angry with them. Today I am neither of these. Today I am just ashamed. If you’ve been on a long-haul aeroplane ride in recent years you will no doubt be familiar with the fantastic invention of noise-cancelling headphones. 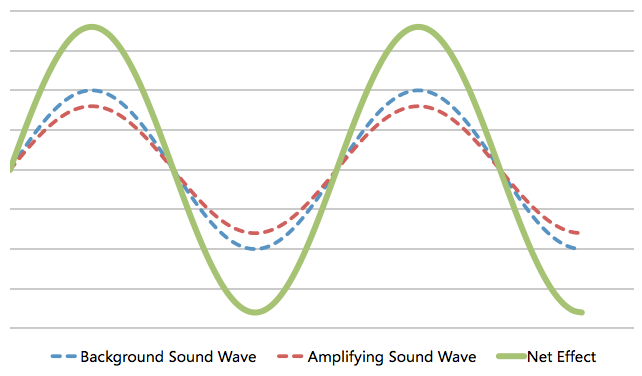 Noise-cancelling headphones use a microphone to measure background noise and then cancel it out by transmitting the “opposite” noise through the headphones. In the economy, my spending is your income and your spending is my income. What I mean by this is that everyone’s income is a result of someone else spending money. If I buy a new pair of shoes then that gives income to the people who work in the shoe shop, people who work in the factory that produces the shoes, people who produce the raw materials such as leather, rubber, cotton, plastics etc that go to the factory, people who drive the lorries etc that deliver the raw materials to the factory, etc etc etc. How did I get the money to buy the shoes? Someone else spent some money on the good or services that I help provide in my job. The point I am making here is that in the economy, spending and income are two sides of the same coin – you can’t have one without the other. Although this is the case, it is far easier to find a politician who says that we should all reduce our spending than it is to find a politician who says that we should all reduce our income. Politicians are a funny sort though. Anyway let’s talk about spending. In the economy, at the highest level, we have two classes of spending – private spending and government spending. Private spending covers things like household spending, (such as the pair of shoes I bought) and the spending of companies. Government spending covers things like the NHS, state education, the armed forces, council budgets, roads – well, anything the government might want to spend money on. The sum of private spending and government spending represent the total spending that is going on in the economy and therefore the total income. In order to maintain a healthy economy a healthy level of spending needs to be maintained but unfortunately the private sector is very unreliable in this respect. The economy is sometimes good and sometimes not so good. When the economy is good the private sector wants to spend money – companies have lots of demand for their goods and services so they increase supply to meet the demand. This means employing more people opening new shops or offices or buying more raw materials from suppliers etc. When the economy is bad and demand for their goods and services is low they respond by reducing spending – making redundancies, closing shops, buying less raw material from suppliers etc. Those peaks are nice but those troughs are a problem. During those troughs, other things being equal, the economy as a whole is going to suffer from a lack of spending and a lack of income. Other things do not have to be equal though. When the economy weakens, the government usually responds by cutting interest rates. This helps by making saving less attractive and borrowing and spending more attractive. More often than not this is enough to get the economy heading back in the right direction. In the case of the current financial crisis though it has not been enough to get things back on track. Interest rates were cut to near zero over three and a half years ago but the economy is still not recovering. Even with extremely low rates people would still rather save and pay down debt than borrow and spend. So what are we left with? Remember that total spending is made up of private spending and government spending. We know that the private sector isn’t spending so we’re left with government spending. If the government keeps their own spending constant then overall spending will drop by the same amount that the private sector cuts spending. That doesn’t help. You notice that when the government spends like this it helps to fill in the troughs and helps to stop overall spending (and therefore income) plunging by as much as it would if left to the private sector. (Note – we’re not asking the government to spend more overall – we’re asking the government to spend more when the private sector is not spending and less when the private sector is spending.) When interest rates can’t help then this is a very sensible fiscal policy – spending and income is to a large extend maintained. Bizarre as it might seem, this was the choice of the UK coalition government. Rather than act to offset the spending cuts of the private sector they chose to amplify them and instead of smoothing over the cracks they have opened them up. This is the Austerity Fallacy – the widely held belief that cutting government spending when private spending is depressed will create economic growth. But your spending is my income and my spending is your income. The government has intentionally engineered a situation where no one in the economy is spending which bizarrely they expected to create growth. But government spending is what got us into this mess in the first place! No it isn’t, I already covered that. But if we don’t slash spending then the rates at which the UK government can borrow will become unaffordable! No they won’t, I already covered that too. You have not read this post properly. I do not say the government should increase spending forever. When the private sector is weak and unemployment is high then there are lots of spare resources in the economy that increased government spending can utilise. When the private sector is strong then the government can reduce spending safe in the knowledge that there are plenty of jobs being created in the private sector for people to move to. I am definitely not advocating high government spending when the private sector recovers – quite the opposite in fact. We have long-term problems in the shape of the government’s commitments to pensions. With an ageing population our pension liability is increasing far quicker than our motivation to address it. I agree that we need to get on top of these things but to decide to try to do it in the middle of a depression is frankly very stupid. When the economy is not working our government has an immediate obligation to fix it. When it is fixed we can go about tackling the long-term things but attempting to tackle them when the economy is depressed is self-defeating – both in theory and (thanks to the government) we can now see, in practice. The government’s policy of choosing to amplify the downturn is not just a mistake, it is entirely negligent and is not just causing unnecessary hardship and unemployment today, it is creating problems that will negatively affect the economy and the lives of many for years to come. Middle-aged people who have worked all their lives are now amongst the long-term unemployed, their savings spent and the prospects for the second half of their careers in tatters. University students are graduating into an economy that has no use for them. Rather than take the skilled jobs for which they have trained they are forced to choose whatever is available and this will affect their prospects and their incomes and their spending and everyone else’s incomes for their whole lives. Whatever we do now, the effects of Cameron’s and Obsorne’s austerity experiment will be felt far into the future and the Chancellor’s new policy of further cuts to welfare in order to pay for the backfiring of this experiment is almost beyond belief. 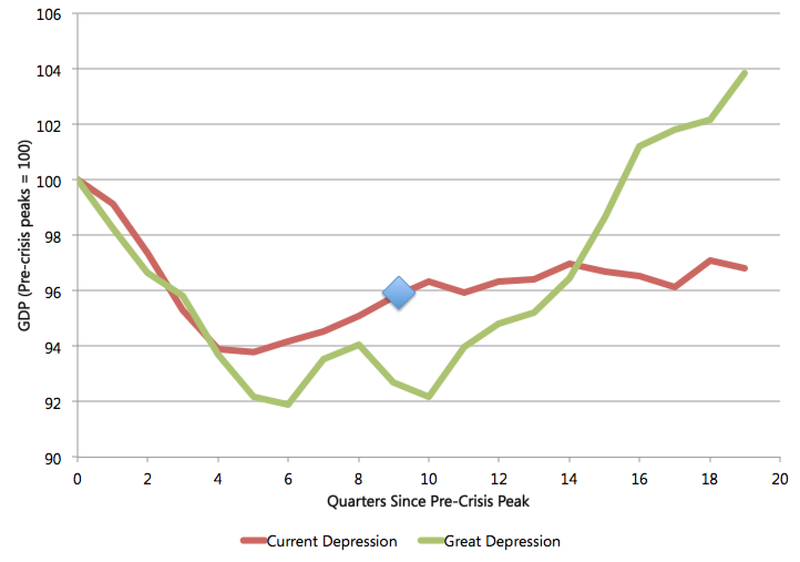 Every model of the current depression says that we will eventually recover. Even with the current government’s policy of amplifying the downturn, all models suggest we’ll get back to a sustainable economy eventually. But why didn’t we do something that would have brought us to that conclusion two years ago? Or failing that why don’t we do it today? The government won’t do it though because it would be political suicide to admit that they had got things so wrong. Too late for that – better to plough ahead and hope they can convince the public to swallow The Austerity Fallacy for another two and a half years.